March | 2015 | Yummytums! Posted at 2:10 pm by Yummytums! In my ongoing quest to eat “clean” unprocessed foods, I’ll admit that I’ve given up a few things that I once enjoyed. Sausage was one of those. But I found a recipe a week or so ago that I figured was worth a try: Homemade Paleo Sausage. It’s easy to make — you can do it in 30 minutes from start to finish — and the flavor is wonderful. Best of all, you can control the quality of both meat and seasonings. This sausage patty doesn’t have any fillers or preservatives. I own a rarely used meat grinder attachment for my stand mixer. It doesn’t often see the light of day, but I pulled it out for this recipe. You will need a meat grinder of some sort. I used one pound of trimmed pork loin and I was a little worried that the sausage wouldn’t have enough flavor because the pork loin was very lean. But the combination of spices and seasonings took care of that. This is one sausage patty that you won’t have to feel guilty about enjoying! First, gather your spices and prepare a skillet with 1 TBSP olive oil. Assemble your meat grinder and cut the meat into cubes. 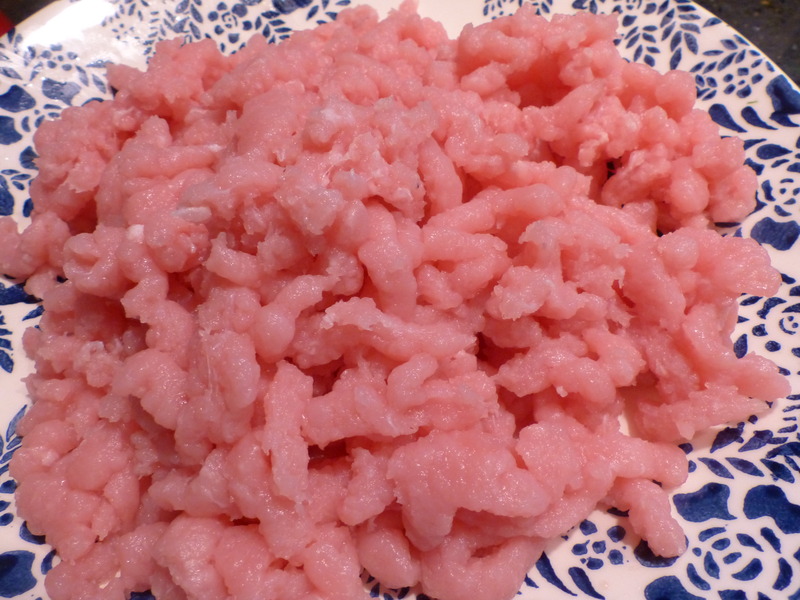 It’s best to use very cold meat for grinding. I also ran the meat through the grinder twice. Once the pork is ground, mix in the seasonings, much like you would knead bread. Shape the meat into eight patties and then fry them in olive oil. You can let them cool and freeze them individually, that way they’ll always be on hand for a quick breakfast. I promise you won’t miss the fillers or fat! Posted at 1:01 pm by Yummytums! Let’s be honest, the quest to eat clean can be challenging when you work full-time. Clean eating requires some advance planning so that you’re not forced to succumb to convenience or fast foods just to get dinner on the table. I’ve found that friends offer great support in my effort to eat unprocessed foods. They share great recipes and tips, like this one for Italian Turkey Meatballs. These meatballs can be made in large batches and then frozen in individual serving sizes. Just pull them out of the freezer and let them thaw in the refrigerator on the day you plan to use them. 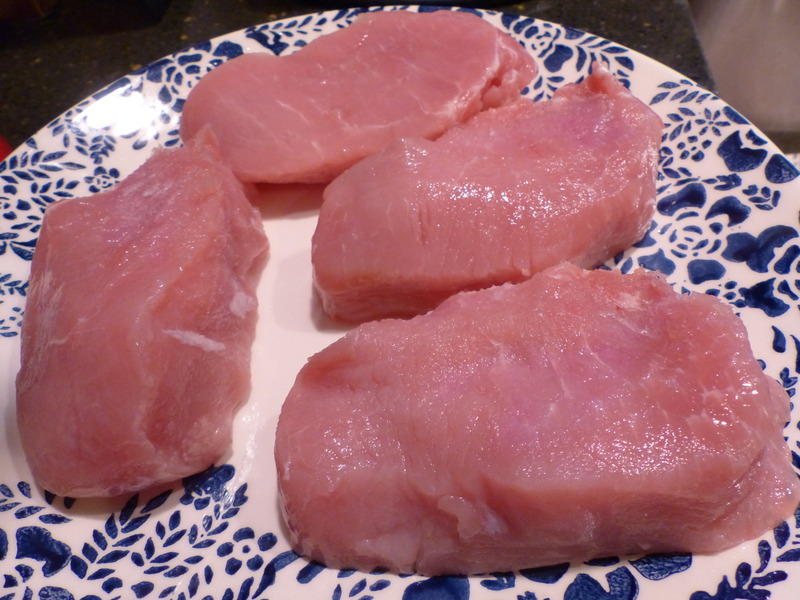 Turkey is a wonderful lean protein, but it can sometimes be a little dry or bland. That’s not the case with these meatballs. The addition of ground fresh mushrooms helps maintain moisture during baking and the liberal use of fresh herbs and other seasonings make for tasty – and healthy — meatballs. Top them with marinara sauce and fresh mozzarella for meatball subs or add them to your favorite pasta sauce for a quick spaghetti and meatballs dinner. This recipe was adapted from Eating Well magazine; it makes approximately 30 one-inch meatballs. But it could easily be doubled if you’re feeding a large family. Preheat your oven to 450 degrees and line a cookie sheet with non-stick foil or parchment paper. Finely chop the onion, mushrooms, celery and garlic in a food processor. Heat the olive oil in a large saucepan and add the vegetables, Italian herbs, salt and pepper. Cook for six minutes or so, until most of the moisture has evaporated. Let the vegetables cool for 10 minutes. Meanwhile, chop the fresh parsley. Place the ground turkey in a large bowl and add bread crumbs, cooled vegetables, chopped parsley and parmesan cheese. Mix lightly and shape into one-inch balls. Place the meatballs on the prepared pan and bake for approximately 15 minutes. I turn them once during the baking process to get them nicely browned. Cool the meatballs on a wire rack. Once they’re completely cool, separate them into serving sizes and place in plastic freezer bags. Label them with the date. I usually try to use them within two months, although I’m sure they could keep longer. 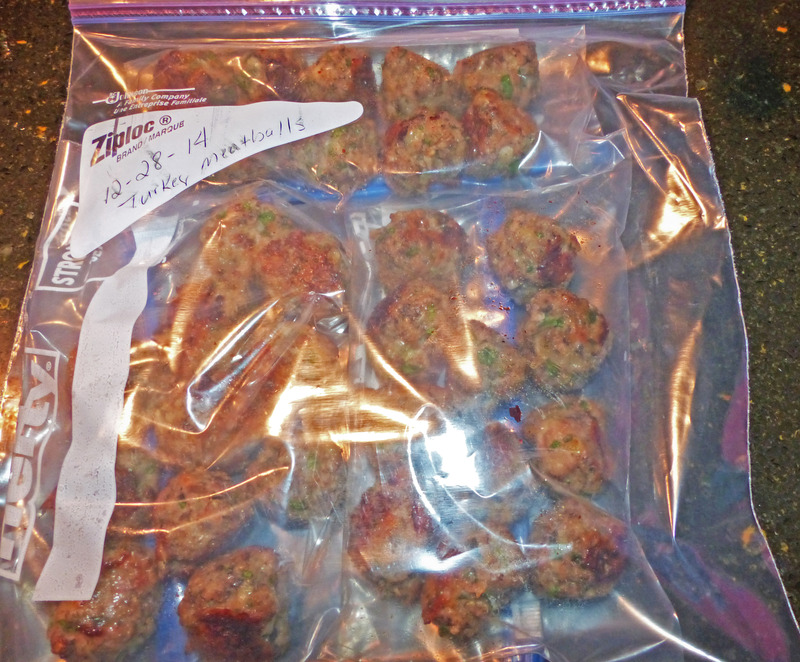 Freeze the meatballs in individual serving sizes.